Summer is a time where many like to go on holiday to all sorts of destinations, from exciting city breaks to adventurous trekking routes. However, it’s good to also be aware of some of the risks associated with travelling, and know what to do if something were to go wrong. At London Doctors Clinics, our doctors are not experts in the field of tropical medicine, but there are a few travellers’ illnesses we definitely can advise on and perform relevant blood tests for. Malaria is a well-known disease that has been the subject of intense research over the past few decades. Although there has been a decrease in cases of malaria since 2000, WHO reported in 2015 an estimated 214 million cases of malaria globally and 438,000 deaths as a result of contracting the disease. This was mainly observed in African countries, where around 90% of all malaria deaths occurred. 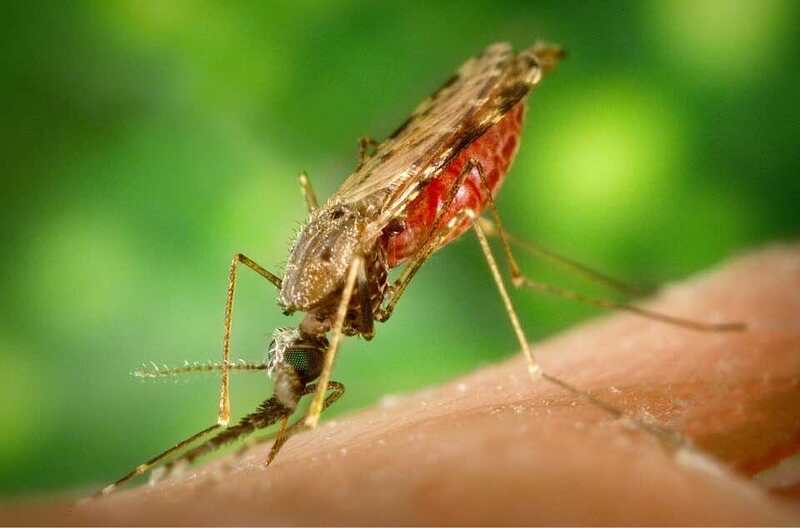 The infection is caused by protozoan parasites called Plasmodium, which can be transferred by the bite of an infected female Anopheles mosquito. Before going abroad, it is important to check whether your destination of travel is included in a malaria-risk area. There are many other preventative measures that can also be taken to avoid contracting the disease. To avoid mosquitoes from transmitting malaria, it is best to prevent them from biting you by using items such insect repellent and mosquito nets, and to cover your arms and legs as best as possible (without overheating). If you are travelling to a high risk area, it may be best to take a full course of preventative anti-malarial tablets whilst you are there. However, certain individuals (e.g. pregnant women) may not be able to take certain tablets, so it is best to consult a travel nurse prior to departure. Since the anopheles mosquito mainly bites at night, a mosquito net over your bed is a very effective way to prevent Malaria. Note that fever associated with malaria can occur in 48-hour cycles depending on the type of malaria-associated parasite – these cycles consist of cold spells (with shivering) followed by hot spells (with severe sweating). Malaria infection usually has an approximately 1-2 week incubation period, however in some cases symptoms can take as long as a year before they are recognisable! If treated properly and recognised in good time, almost everyone will recover from this disease. Anti-malarial medication can be used as both prophylaxis (treatment to prevent the disease) and treatment. However, some of these medicines are not recommended if you suffer from certain disorders (for example epilepsy), so it is important to clarify this with your travel doctor nurse before starting any sort of treatment. It is very important to seek medical help immediately if you suspect your symptoms are similar to malarial ones. A vaccination for malaria has been the subject of furious research, and recent trials show that the scientific community is making progress. The RTS,S/AS01 malaria vaccine was trialled in 7 African countries (a phase III trial began in 2009), and whilst results from this trial may be mixed, there is still hope for the future. Concerned about Malaria? London Doctors Clinic are happy to help! At LDC, our Private GPs are happy to see any patients suspicious of malarial infection. We offer malaria blood tests to diagnose the disease: the blood for which we’ll take during your consultation. Alternatively, we also offer a Malarial antibodies test, to investigate previous exposere to Malaria (specifically plasmodium falciparum). Malarial Parasites Blood Test costs just £71.20. Results available STAT. Malarial Antibodies Blood Test (for Pl. falciparum) costs just £87.20, with results available within 2 working days. Please note, patients experiencing severe symptoms, or who are acutely unwell after visiting a Malaria-zone, we would recommend going to A&E or a hospital for tropical medicine for immediate treatment. As the most affordable Private Doctors in London, we also offer last-minute and same-day appointments. So if you’re at all concerned about Malaria, can’t get an NHS GP appointment soon enough, or don’t want to be stuck waiting around A&E (potentially unnecessarily!) for hours on end, one 15-minute consultation at London Doctors Clinic may be all it takes for the answer you need. Book in today!